For almost 5,000 years, the hamlet of Arctic Bay and its surrounding area has been occupied by Inuit nomads migrating from the west. Surrounded by soaring cliffs teeming with seabirds, this is a great spot to go ashore and learn about the Inuit community’s traditional way of life. The eastern end of Lancaster Sound affords numerous hiking opportunities on Devon Island. 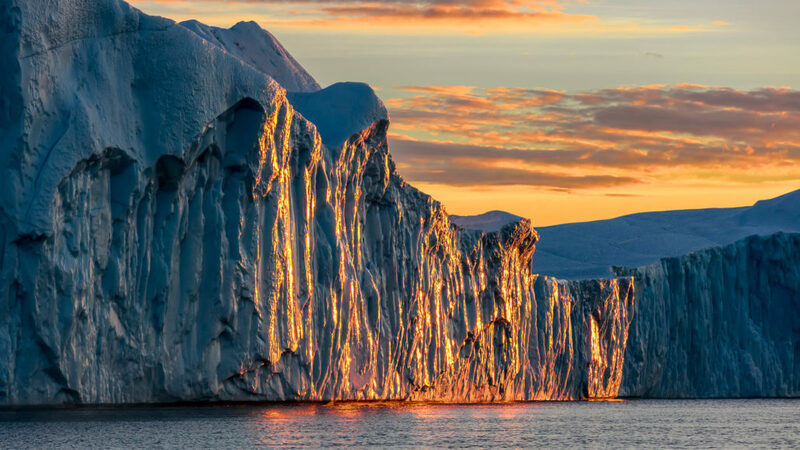 We’ll anchor at Croker Bay, where we’ll Zodiac cruise along the face of an active glacier. We’ll try to keep a safe distance, but still hope to get close enough to appreciate the splendor of calving ice. Walrus frequent the waters here, so be sure to have your camera handy. A hike to a nearby archaeological site is another possible excursion. At Dundas Harbour, trek along a beach to a former Royal Canadian Mounted Police outpost. Encounters with muskoxen are possible here. 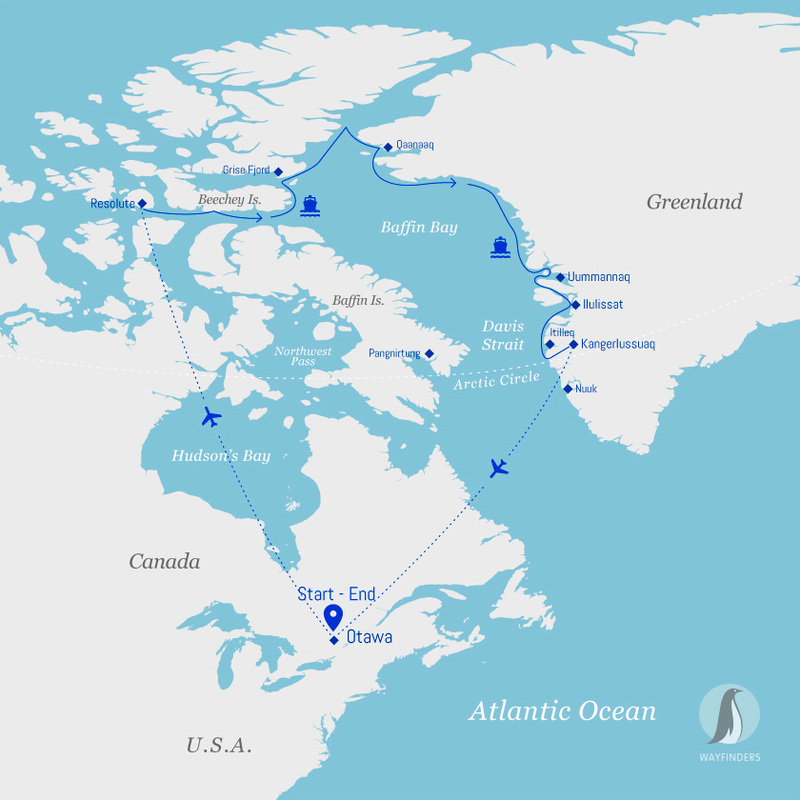 Canada’s most northern settlement, Grise Fjord will be your final shore visit in the Canadian High Arctic. Now home to about 150 residents, the traditional, mostly Inuit community was created in 1953, when the federal government resettled eight Inuit families from northern Quebec. Hunting and fishing are a significant part of their way of life. Visit the monument to the first Inuit settlers, as well as the remnants of the “old camp” where they lived. Nuussuaq (formerly known as Kraulshavn) is the only mainland com­munity in the Upernavik Archipelago. Founded in 1923 as a trading station, it’s one of the most traditional hunting and fishing villages in Greenland . It’s not surprising that the red-hued, heart-shaped mountain that rises up behind Uummannaq gave the tradition­al community its name (Uummannaq means “heart-like” in Greenlandic). As your ship approaches the shore, you’ll want to be on deck to take in the in­credible view of the twin peaks tower­ing over the vibrantly painted wooden houses dotting the rocky terrain below. The settlement was established as a Danish colony in 1758 on the mainland, but it relocated five years later because seal hunting was more plentiful here. In the nearby archaeological site of Qilaqitsoq (also known as Qilakitsoq), you’ll visit the ruins of an ancient settle­ment, where the remains of eight fully dressed mummies were discovered under a rock outcrop in 1972 by a pair of hunters. The famous Greenlandic mummies, which date back to 1475 AD, are on view at the Greenland National Museum in Nuuk. Situated in a scenic hollow on a small island with no freshwater, the colorful community of Itilleq, which has about 130 inhabitants, is surrounded by sea, mountains and fjords. The final excur­sion of your arctic adventure may be a hike around Itilleq Fjord.